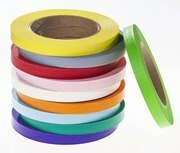 These color-coded label tapes work well with all glass and plastic labware, racks, tubing, bags, boxes, and cabinets. It adheres to any surface and peels off without leaving a sticky residue. Tapes resist moisture and most solvents and can withstand autoclaving (250°F). It may be used as well down to -73°C. All rolls fit on a standard 1" (25.4 mm) or 3" (76 mm) core. Tape is available in widths of ½" (12.7 mm), ¾" (19 mm), and 1" (25.4 mm), 40 yards (36.6 M) long. For general laboratory use. Easy to write on with permanent markers. Water-resistant. Can be used on small diameter vials. Thermal transfer ribbon, used for automated cassette printing. Prints up to 20,000 cassettes per roll. Designed for use on TBS SHUR/Mark® cassette printers and Thermo MicroWriter® cassette printers. CrystalView™ Coverslipping Film is a proprietary, resin coated film that eliminates the need for glass coverslips and sticky liquid mounting media. The flexible, tri-acetate film is coated with a xylene-activated resin on the underside, and exhibits an optical clarity comparable to glass coverslips. The coverslipped slide is free from distortion, debris, and is optimized for use on most standard automated film coverslippers. 24mm x 70 meters per roll, which can coverslip up to 1,400 slides. Printed diagonal stripes darken indicating a steam autoclave process is complete. Stripes darken after 5 minutes of exposure at 273°F (134°C) at steam pressure of 1.02 kg/cm2 or marker. Write Protect is a clear adhesive tape designed to cover and protect writing or printing on labels, on the surface of microtubes and on other laboratory containers. 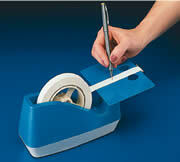 The clear tape comes in a handy dispenser and will adhere to all plastics, glass, metals and label materials. 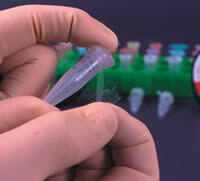 The tape is provided in perforated, pull-off segments for 0.5 ml and 1.5 ml tubes. Write Protect will not dry out, peel or fall off and will withstand temperatures ranging from -196°C to 150°C. These tapes mold tightly to any container, withstand acids, alkalis, oils, and greases. They will not crack, peel, or fall off in 550°F dry oven temperatures. Hi/Lo temperature tape also sticks tightly in dry ice, liquid gases, and in deep freeze conditions of cryogenic temperatures. 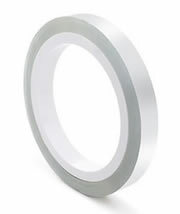 Tape is available in widths of ½", ¾" and 1" on 250" roll. This tape must be cut with scissors. Specialty cloth-textured Hi Temperature Indicator tape shows the word STERILIZED" in bold, black letters after standard sterilization processing. The tape sticks to almost any surface or shape, holds fast in 550°F dry oven temperatures. Available in widths of ½", ¾" and 1" on 250" rolls. High quality tape specially designed for steam autoclave conditions. Indicator tapes provide immediate identification to verify exposure to sterilization process. Designed for use at 250°F (121°C) for 30 minutes or 270°F (132°C) for 4 minutes. Easy to read color change indicator. 60 yard rolls. 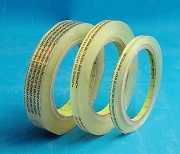 Versatile imprinted tape indicates completion of normal steam sterilization processing. Tape accepts handwritten notations, may be used to seal and identify laboratory materials before and after processing. 60 yard rolls. This transparent tape can be removed as easily as it goes on. Ideal for taping before photocopying, leaving notes and memos, taping transparencies onto frames, etc., 3" core. The ever popular tape that is invisible when applied. Can be written on. Resists yellowing, cracking, and moisture. Ideal for mending, slicing, and many other permanent applications. 3" core. Black, crepe paper, pressure-sensitive tape that is designed for use in commercial as well as private photography. It can be used for making negatives, positives, and transparencies. Conformable, opaque, and it has low light reflectance. 3" core. is ruby-red transparent tape is for use in opaquing, stripping, and edging on film materials. 3" core. Good for making glass knife boats as well as for hanging, protecting and stripping. 3" core. This is a non-conductive transparent tape with adhesive on both sides. There is no liner to remove and it is long lasting for permanent applications. 3" (77mm) core. This is a non-conductive transparent tape with adhesive on both sides and white paper as a liner, which is slit in the center to facilitate its removal. This produces good adhesion and cleanliness. 3" (77mm) core. 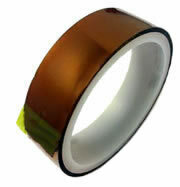 Kapton® Polyimide Tape is known for its superior ability to maintain its physical properties under harsh conditions. This general purpose film easily bonds to difficult surfaces with silicone adhesive, and leaves little to no residue when removed. Microscopists find it ideal for holding samples or masking during deposition in vacuum systems (it is relatively low outgassing). It is also perfect for positioning samples in cryo or high temperature working conditions. There are no known organic solvents for the film. Tape thickness with adhesive: 2.7 mil. No liner. Tape thickness with thinner layer of adhesive: 2.5 mil. No liner. Tape thickness with adhesive on both sides: 4 mil. Clear polyester liner covers one side. ESD additive in the adhesive reduces the static charge. Tape thickness with adhesive: 2.6 mil. No liner. We offer two types of foil: Aluminum foil tape (Scotch 1170) and copper foil tape (Scotch 1181) with conductive adhesive. 3" core, ¼" (6.35mm) width x 54 ft (16.5m) long. With the same technical properties of our 77802 shown above this conductive tape is 12.7mm(W) x 16.4m(L). We now offer a new line of conductive tapes, that are electrically conductive and offer a clean background. They were developed especially for SEM. With carbon double-sided tape, small particle sizes, such as 15-20 microns, can be mounted on the adhesive and produce good background structure. Our Double sided Carbon tape is also available in five widths to accommodate varying specimen mount surface sizes and applications. Same as above however with Aluminum base as opposed to the unwoven base above. Offers a smoother surface. EMS introduces this unique double sided carbon tape which is 260 microns in thickness. The base which is Polycarbonate and 200 microns thick has on both of its sides 30 microns of conductive glue giving it a total thickness of 260 microns. The tape has one transparent liner on one side and a white thicker one on the reverse which protects the tape in shipping. These conductive cohesive sheets offer good adhesion to the specimen and yield good conductivity and background structures, even with particles as small as 15 microns. Conductive Tape 9712 is an isotropically conductive pressure sensitive tape. The tape consists of a 3M adhesive loaded with conductive fibers. The result is a double-sided tape providing both good adhesion and good electrical performance with very high conductivity. The 9712 Tape is an excellent choice when needing to bond your samples for all SEM work. Based upon four wire (Kelvin probe) resistance measurements made with crossed pieces of Foil/Type 9712 or 9713/Rigid plate construction using a 1.0" x 1.0" square piece of 3M tape Type 9712 or 9713. The rigid metal surface was prepared with a Scotch-Brite™ pad to roughen the surface and cleaned with isopropyl alcohol. 3M™ Electrically Conductive Adhesive Transfer Tape 9703 is a pressure sensitive adhesive (PSA) transfer tape with anisotropic electrical conductivity. The PSA matrix is filled with conductive particles which allow interconnection between substrates through the adhesive thickness (the "Z-axis") but are spaced far enough apart for the product to be electrically insulating in the plane of the adhesive. The PSA tack properties and lack of any thermal curing make tape 9703 easy to use in all applications requiring a conductive tape. Durable and economical; high impact resistant plastic dispenser. It features a permanently attached tape drum to eliminate loss. A rubber base prevents slipping. Two tone brown and beige. Holds tape up to 1" wide. 3" core. This tape dispenser offers you a convenient writing platform, suitable for both left- and right-handed users. The epoxy-coated platform with finger holes and built-in cutting edge, make dispensing and cutting the tape a simple one-handed action. The weighted base with non-skid bottom pads assures stability. 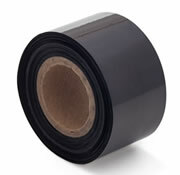 The 3" (76mm) core fits standard tape rolls up to 1" (25mm) wide. The weighted base with non-skid bottom assures stability when in use. Weight: 4 lbs (1.8kg). The dispenser accepts series 77010-tapes shown above. The tape is not included. This dispenser holds 1 & 3" core Write-On Label Tape. Measures: 302 x 143 x 160 mm H (12 x 5⅝ x 4-3/16"H).Two types. This tape dispenser allows tape rolls of various widths and colors to be mounted on a single drum and reeled off individually as needed. Accepts all 3" (76mm) core roll tapes. Separators keep tape rolls apart. Writing platform is 4" x 6" (102 x 152 mm) with a serrated cutting edge. The weighted base with non-skid bottom pads assures stability. Made from epoxy coated steel. Measures 10¼" x 6" x 4⅜"(H) (260 x 150 x 110mm). Weight: 5 lbs (2.3kg). Tape not included. MD Models: Made from durable polycarbonate for visibility and easy cleaning. Cutting edge is stainless steel and suction feet help hold in place. Spindles drop in for quickly changing out rolls. For use with 60-yard tape rolls. SD Model: Made from durable plastic. For use with 60-yard tape rolls. We offer three different size dispensers to accommodate your 500" tape rolls (1" core) on countertop or cart; and one size dispenser for 2160" tape rolls (3" core). They provide easy dispensing while keeping all tape in one convenient location. A unique design allows easy addition or replacement of rolls without removal of every other roll on the dispenser. Made from sheet metal. Slit-Perforated Laboratory Tape – No Scissors Needed! Convenient – Slit-perforated every 1.25" to allow for clean tearing every time. Quick – Don't waste time with scissors, simply tear and apply! "Invisible" Perfs – High-tech perforations are designed to remain "invisible" when tape is marked and may be written over. Strong – Perf-Tape™ won't tear while it is being unrolled. No residue – Leaves no adhesive residue when peeled off. Water resistant – Also oil and acid resistant. Temperature – Withstands cold (-23°C) and hot (121°C) temperatures. * RPM limits may vary based on load and vessel contact area. Test load recommended.